Cattle prices have struggled to move higher as beef supplies have been increasing. During the 3rd and 4th Quarter record supplies of animal proteins (beef, pork, and poultry) will continue to be harvested. Cold storage levels for all meat proteins are either at or above 2017 and 5-year averages. These supplies will be a price-limiting factor, despite extremely strong export beef demand. Additionally, losses at the feedlot level are mounting and expected to continue into the fall dampening overall price bids for replacement feeder calves. 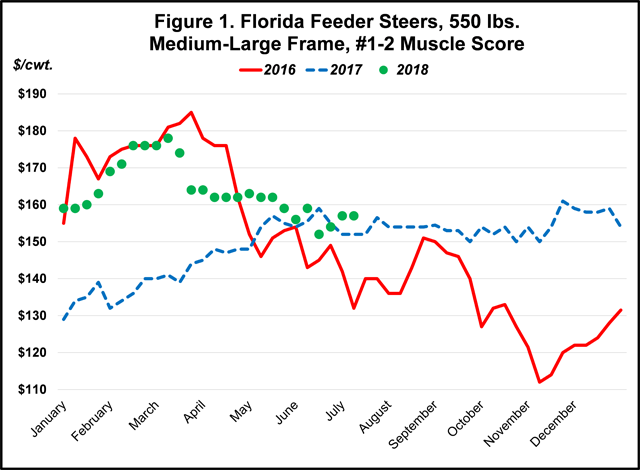 Figure 1 looks at 550 pound Florida Feeder Steers for 2016, 2017, and 2018. As shown in Figure 1, 2016 feeder calf prices (red line) maintained their price level early before severely declining over the second half of the year as meat protein supplies exceeded demand. During 2017, feeder calf prices (blue dashed line) never weakened moving from summer into fall as exports improved throughout the year. The stabilization in price during the second half of 2017 was unusual, as seasonal weakness typically occurs during the fall as feeder calf supplies reach the peak. However, exceptional export beef demand kept prices above 1st half 2017 levels. Thus far, the 2018 feeder calf market has continued to maintain prices at or above 2017 prices levels. The price range for 2018 Florida 550 pound Feeder Steers has traded in a $26/cwt. ($178 – $152/cwt.) or $143/head ($979 – $836/head) range. While, that dollar value may seem large, a comparison over the past few years proves that 2018 has been less volatile. Looking forward at the 2018 fall calf market, a quick look at the headlines reveals the uncertainties that exist around tariffs and trade agreements. Therefore, there is risk to calf values as producers look at marketing their animals this fall. Figure 2 shows the 10-year seasonal price index for U.S. 550 pound Feeder Steers (2008-2017). 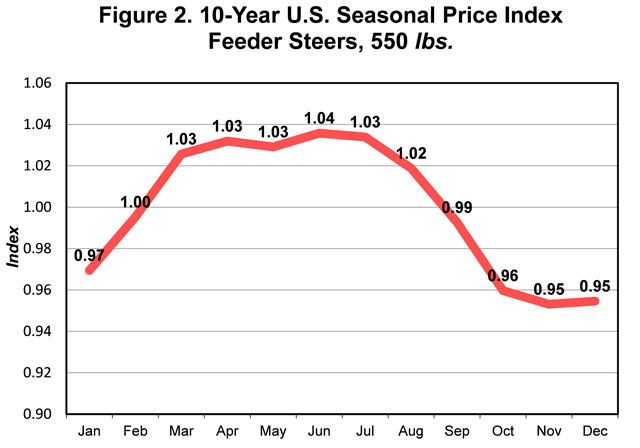 The price index is simply a ratio of the monthly average prices to the yearly average price over 10 years. The price index ranges from 0.95 in November to 1.04 in June. The price index provides us with a relationship of how prices change during the year based on a 10-year history. The 10-year price index suggests that feeder steer prices increase in price from January through June, and declines significantly from July through November, and begins to slightly increase during December. Thus far in 2018, cash feeder steer prices have closely followed the seasonal price trend. As seen in Figure 2, a decline in feeder steer prices during the fall months is normally expected due to the larger number of calves coming to town. If Florida Feeder Steers prices follow their seasonal price trend during the second half of 2018, then calf prices will decline this fall. Given the assumption that Florida 550-pound Feeder Steers followed this seasonal trend, the realized Florida 550-pound Feeder Steer market price in November would be approximately $142/cwt. ($155/cwt.*(0.95/1.04)). Thus, the 10-year index expects a typical price break from summer (June) to fall (November) of $13/cwt. ($155-$142/cwt.) or $72/head. If the above scenario is followed, producers may consider selling feeder calves earlier to avoid the fall price declines. Also, for those selling in truckload units, they may consider pre-selling (forward contracting) feeder calves for fall delivery. Answering the question “Will Feeder Calves Maintain Their Price Levels Through the Fall?” will help you decide when to market 2018 feeder calves. Based on the long-term trends of the feeder calf market, producers should expect prices to decline from July to November. Producers seeking higher income for feeder calves held for fall delivery should consider forward pricing to protect their investment while adding additional pounds. Good luck marketing your 2018 feeder calves.